Indigenous peoples lived and thrived in what is now Louisiana for a few thousand years prior to European exploration. The French explorer LaSalle descended the Mississippi River in 1682 and claimed the land for the French Monarch, Louis XIV. It was not until 1699 that D’Iberville was to establish a permanent French presence in the lower Mississippi Valley. Louis Juchereau de St. Denis founded the first permanent settlement in Louisiana in 1714 with construction of Fort St. Jean Baptiste near present day Natchitoches. D’Iberville’s brother, Bienville, solidified the French claim to Louisiana in 1718 with the founding of New Orleans. France controlled the Louisiana colony until 1762 when the colony was ceded to Spain under the Treaty of Fountainebleau. Spain ruled the colony until 1800 when the lands west of the Mississippi River were returned to the French in the Treaty of San Ildefonso. In 1803 the United States purchased the Louisiana Territory from France for $15,000,000. The Louisiana Purchase has been deemed the greatest land acquisition in history, “changing the balance of world power“. Through much of its early history Louisiana was a trading and financial center, and the fertility of its land made it one of the richest agricultural regions in America. 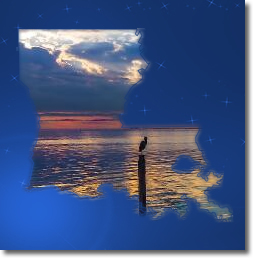 In 1812 Louisiana was finally admitted to the United States as the 18th state. Relationship with the Union, however, was to be tested by the issues of slavery and states rights. After the Louisiana Purchase, New Orleans became the most active slave market in the entire country. In January 1861 Louisiana formerly seceded from the Union. During the ensuing Civil War, numerous engagements were held in Louisiana, most notably at Port Hudson, where the longest siege campaign of the war took place. After the War, the state endured 12 years of reconstruction, the longest occupation of any of the southern states. The plantation economy was shattered by the Civil War although the state continued to be a powerful agricultural region. The discovery of sulphur in 1869 and oil in 1901, coupled with the rise of forestry sent the state on a new wave of economic growth. The 20th century saw Louisiana emerge as one of the nation’s leading producers of oil, sulphur, sugar and cotton. Eventually, Louisiana became a major American producer of oil and natural gas and a center of petroleum refining and petrochemicals manufacturing, which it remains to this day, ranking second in the nation in oil production. Native Americans, Africans, Europeans, Americans, Acadians and many immigrants have contributed to the rich and diverse cultural history of Louisiana. Governed under 10 different flags, Louisiana displays one of the most varied and colorful pasts of any of the states.